Back in Jirandogo once again! Arrived on Thursday and met with the ladies on Friday. What a group of ladies! They continue to bless me as they are being more comfortable coming and we are beginning to know each other some. I look forward to the day that I will be able to call each of them by name (all 200+)! 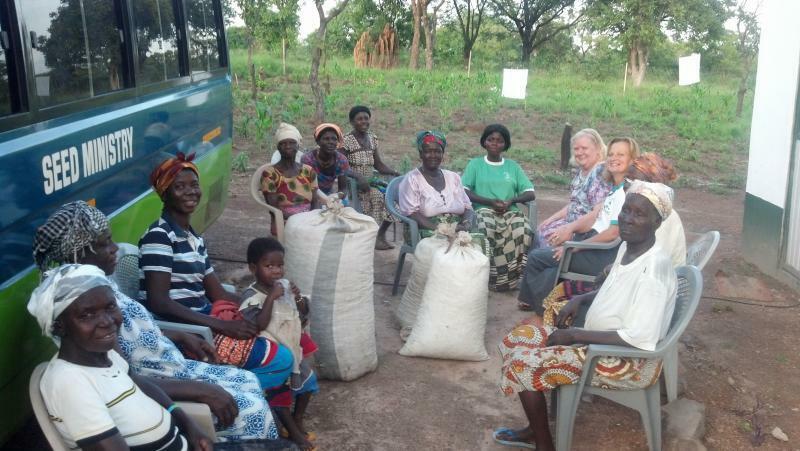 Last month as they harvested their groundnuts (peanuts), they wanted to share something with us… so they brought us enough groundnuts to fill one and a half barrels! We were completely overwhelmed with their generosity. This will be the 3rd month of CLTA classes and we are very excited. It has been awhile since we have written a Blog so to briefly catch up…. The South Fork team and Jessie have all arrived home safely, John H. came and he leaves Ghana tonight. What a joy he is. Ready to do anything needed anytime. He really expected to do a lot more physical labor than teaching and preaching but God used him and his testimony to reach many people. Praise God for the ways He works in all of our lives and especially the way He uses our personal testimonies to speak to others. Share your testimony with someone today. You will be blessed – they will be blessed! We have been blessed to house a Southeast Christian team as they worked with Francis, Pam and Pastor Zak’s ministry. During their stay, Amy & Terry R. brought the Grahams, a new family ministering with them, to introduce them to several missionaries here. We had a GREAT potluck supper and even better time of fellowship with all of them. My trip to Ghana has been an awesome experience. When the plane landed in Accra, I thought this place is not too bad. However, the next day when we were headed into Tamale, I cannot lie, I was thinking, “Take me back home.” I was experiencing what they call ‘culture shock’. Everything was so different. I mean far, far different from home. We were riding into Tamale and we began to start passing by those little booths that the people had set up. That is how they make their living; everybody is selling something. Some sell and live in their booth. They were selling anything from cell phone cards to little plastic bags to fresh butchered meat laid right out in the open air; fruits and vegetables, you name it. There were so many people on the road. I just knew we were going to run over somebody. Motorcycles everywhere, bicycles everywhere, people walking everywhere. The next day and through the week Bob sent me with Thomas to the schools to share Jesus with the children. These were public schools, not Christian schools. Most of the kids I made laugh and some of the little ones were scared of me. The kids are like sponges when it comes to learning. They are very excited. Most of them were happier to see me than my own kids. They love shaking hands, giving fives, and feeling my hairy arms. They love to play. Most of them in Tamale could speak good English but not so much in Jirandogo. But the language barrier didn’t stop the relationship. Most of the people were happy to see me and were very kind. They were very respectful and they love greeting. The Bible Clubs we visited were awesome. These kids know the Word. I was learning from them. I just encouraged them to keep on doing what they were doing. The sad part is when you see kids carrying water to school and it looks like gasoline in the battle. They turn it up and drink it like nothing. When you hear them cough a horrible cough and when you touch them, you can feel the fever; swollen bellies and growths. There is so much you want to do. The Lord has shown me that the children and the adults are eager to learn the Word of God and they need our help with drinking water, which we as Christian Americans are able to do. We cannot save all of them but that is no excuse not to save the ones we can. The trip for me has been a motivation to help Seed Ministry more. Not everybody has to be a preacher or a teacher; they just have to be willing to help. I encourage you to step out of the boat and come see how God can use you. Bob and Bonnie will take great care of you. I really want to thank them for having me. God Bless. John H.
Please tell us more about a way we can provide fresh water. Besides providing the "Water of Life" we also want to know what it will take to deliver drinking water.